By Azzief Khaliq in Gadgets. Updated on April 6, 2018 . We’re all probably aware of the fact that our smartphones and other devices emit electromagnetic energy. So far, though, nobody’s really come up wtih a great way to harness these emissions, especially the electromagnetic energy that’s emitted by smartphones. While the amounts of energy emitted are quite small, this is still potentially wasted energy that nobody’s been able to harness. Until now, that is: say hello to the Lunecase. The Lunecase is an intelligent iPhone case that utilizes the iPhone’s electromagnetic emissions to power LEDs on the back of the case. These LEDs display notifications, letting you know when you have an incoming call or text message. Sounds interesting, right? Let’s take a look. At first glance, the Lunecase looks like any other iPhone case being simple and stylish. It’s made out of high-quality plastic with a rubber coating that’s designed to make the case nice to touch but also ensures that it’s grippy enough to prevent your iPhone from slipping out of your hands. The real magic happens when you receive a call or text message. 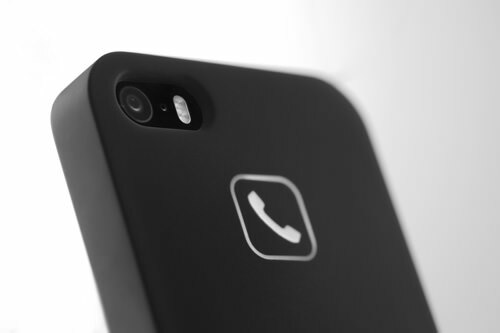 LEDs on the back of the case will light up, showing you two separate icons for incoming calls and text messages. The team behind the Lunecase aren’t divulging how the case harnesses electromagnetic energy, but the fact that you can have notifications on the back of your case without an additional battery or without it drawing from your iPhone’s battery ensures that the case is just as thin as other cases on the market today. Even better, it doesn’t have an adverse effect on battery life. The fact that the Lunecase doesn’t require its own battery also means that installation is as straightforward as ever. Just snap the case on and you’re done. The Lunecase will fit the iPhone 5, 5s and 5c, and only operates on GSM networks. Users on CDMA networks such as Verizon and Sprint are, sadly, out of luck. And, if you’re worried about having to leave your iPhone face down to see notifications, rest assured that the Lunecase has a slight lip to ensure that your screen doesn’t touch the surface when it’s placed face down. The Lunecase has met its funding goal, but you can still pledge $39 for a Lunecase in either its iPhone 5/5s or iPhone 5c variants. If you’re outside of the United States, expect to pay an extra $5 for shipping. Production is scheduled to begin in July 2014, and the Lunecase should start shipping in August 2014. Additional colors will be available once the Kickstarter campaign is completed.